At 18:58 on 29 September 2013 a star with a halo moving in the sky over South Africa. The halo was like that of the moon on a full moon, and was moving in a Northern direction. Reports about a unidentified flying object streamed in from observers in southern Africa and the Indian Ocean islands of Mauritius and Reunion. Many people wondered whether it was a UFO, a satellite or a star cluster but the strange phenomenon appears to be a fuel dump from SpaceX rocket launch at 18:00. 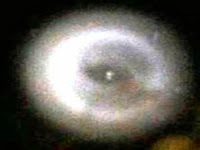 If you look at the top image carefully you can see that the "cloud" around the "star" forms a torus. It is subtle but this is definitely not some fuel dump. Also, of note is how the nucleus at the center of the toroidal structure is giving off light and how the outer halo seems to have less of a clear structure when compared to the toroidal structure. This is definitely not a fuel dump.Because if it is in the earth's atmosphere the gas would have evaporated eventually and would have stayed behind before the satellite took its course to the outside,not follow the object or get bigger and more clearer than it was.Why would someone want us to believe in something that is not true and why do they think people will believe the story,are they afraid to say they do not know what it was or that NASA did not pick it up until it happened.Something is getting covered up. I saw the exact same insident. as far as I can remember the one I saw came towards my house i could not say how far it was away but it had like a blue plasma spinning arround two to five revelutions a second the blue ora got big as it got closer. it hovered for a few second. i yelled at my wife to bring the camera and took 2 or 3 pics on my cam but you can not see the neclues the light was very sharp penetrating light spot at the center. it eventually turned to the north and moved slowly over the hills. as far as i know fuel dumps dont travel in balls and it does not glow this object was in a very low part of the atmosphere. Are there aliens in Moon´s occult face?, perhaps they could be go to/come from faraway in straight line, for not to be detected from Earth. (TV): Apollo XI astronaut said by radio..."They are here...on aside crater...watching us". Why not gone again to Moon from half century ago?